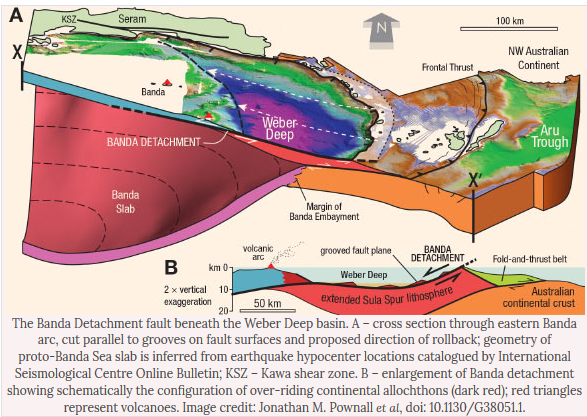 An international team of geologists from the Australian National University and Royal Holloway University of London has for the first time documented the Banda Detachment fault in eastern Indonesia and worked out how it formed. The research is published in the journal Geology in 2016. “The find will help researchers assess dangers of future tsunamis in the area, which is part of the Ring of Fire – an area around the Pacific Ocean basin known for earthquakes and volcanic eruptions,” said lead author Dr. Jonathan Pownall, from the Australian National University. By analyzing high-resolution maps of the Banda Sea floor, Dr. Pownall and co-authors found the rocks flooring the seas are cut by hundreds of straight parallel scars. These wounds show that a piece of crust bigger than Belgium or Tasmania must have been ripped apart by 74.5 miles (120 km) of extension along a low-angle crack, or detachment fault, to form the present-day ocean-floor depression. “This fault, the Banda Detachment, represents a rip in the ocean floor exposed over 14.8 million acres (60,000 sq. km),” Dr. Pownall said. “This was the first time the fault has been seen and documented by researchers,” said co-author Prof. Gordon Lister, also from the Australian National University. “I was stunned to see the hypothesized fault plane, this time not on a computer screen, but poking above the waves,” Dr. Pownall said. According to the team, the discovery of the Banda Detachment fault would help assesses dangers of future tsunamis and earthquakes. “In a region of extreme tsunami risk, knowledge of major faults such as the Banda Detachment, which could make big earthquakes when they slip, is fundamental to being able to properly assess tectonic hazards,” Dr. Pownall said.